Our Company - Septic Solutions Inc.
Septic Solutions’ mission is to improve the onsite industry by providing a wide range of products to customers throughout the United States so that they can enhance the operation of their onsite wastewater treatment systems; ultimately preserving our one and only environment for many generations to come. We are dedicated to always exceed customer expectations through friendly service, convenience, and superior quality. Septic Solutions is devoted to making the maintenance of your onsite system process as simple and beneficial to the customer as possible. About Us - A Brief History of Septic Solutions, Inc.
Our company was founded in 1989 by Jesse James and family under the name James Backhoe Service. In those days, Jesse and a small crew of workers installed septic systems, mainly aerobic systems, around the area in southern Illinois. James Backhoe Service installation and service company grew over the years into the largest in the state of Illinois. This installation and service company continues to be one of the largest installers of septic systems in the state, installing between 150 to 200 systems per year. By 2001 our installation and service company grew large enough to become a state-wide distributor for an aerobic treatment unit and other septic supplies. This meant assembling the aerobic tanks and carrying large inventories of other products. A new company was founded by the James family under the name Septic Solutions, Inc. to handle this task. Septic Solutions began to set up, train, and develop a large network of dealers across the state of Illinois to which we distributed our aerobic tanks, septic tanks, and miscellaneous parts. This large network of dealers continues to grow and prosper with us as the years pass. In 2003, we began our online store to serve customers nationwide and even worldwide. 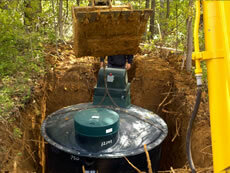 Our goal was to offer a wide array of septic system products for every application at the lowest possible prices. We strive every day to meet this goal and bring you the highest quality products at the lowest prices on the market. All five members of the James family continue to own and operate both businesses with the help of several other employees. We have the experience and we know the products. 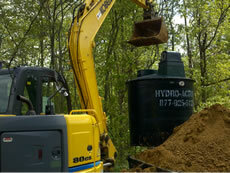 You can trust Septic Solutions, Inc. to provide you with the high quality products and customer service that you need. 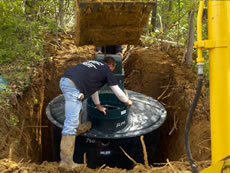 The Experience of Septic Solutions, Inc.
One of the advantages of purchasing your septic system products from Septic Solutions is that we know the products we sell. Septic Solutions is owned and operated by a family that has been installing, servicing, building, designing, and selling septic systems and supplies since 1989. We know the products we offer because we have been using and maintaining most of them for many of those years. During that time we have discovered what products work and what do not, what products last for extended periods of time, and what products do not. Septic Solutions will not sell products that we do not believe in. Our knowledge of the products we sell is based on many years of experience building, selling, installing, and servicing those products. We only offer top-notch quality products that we know works and you will be satisfied with. Our very experienced staff can readily answer your questions and point you in the right direction to ensure you get the products you need and that they will work for your application. Whether you are a homeowner and want to repair your own aerobic air pump, or a contractor looking for hard to find products offered at volume discounted pricing, you have come to the right place. Our store is loaded with the products you need to keep your existing aerobic or septic system operating properly. There you will see many hard to find products, at valued pricing, most of which comes with free same day shipping. Septic Solutions is dedicated to make sure your online shopping experience for anything related to a Septic System will be a happy experience insuring that you will come back to us when you need more supplies and that you will tell your friends and neighbors how easy it was to purchase great products at very reasonable prices from Septic Solutions. Please know that all of us at Septic Solutions truly appreciate your business and will be here to support you and the products we sell for many years to come. Over 850 Septic Products! Free Same Day Shipping On Most Items! Thanks For Visiting Septic Solutions®! © Copyright 2003-2016 Septic Solutions, Inc. All rights reserved.